Most of my clients already know, but I thought it would give me an extra kick into gear if I announced it on my blog aswell. 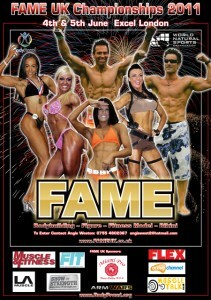 I have signed myself up for the FAME UK Championships to be held on June 4th and 5th in London next year! So far the training is going to be broken into intensification and accumulation phases (Poliquin style) with double training splits on Chest/back and arms! I’m aiming to get my bodyfat down to 10% precomp, then have 8 weeks of serious fat stripping to get down to 4-6% and look awesome! Keep an eye out for regular updates!